TSNPDCL Sub Engineer (Electrical) Answer key 2018 Download With Question Papers for 8th July Exam: Northern Power Distribution Company Limited, Telangana State (TSNPDCL) has organized the Sub-Engineer Examination on 8th July 2018 across the state from 10.30 AM to 12.30 PM. The Telangana SE examination was conducted in many examination centers across the state. The competition is severed this year for Sub Engineer posts. Many of the applicants have appeared for the TSNPDCL Sub-engineer examination with a great aim to get the job. Aspirants appeared for the examination can cross-check the answers from the TSNPDCL Official portal, tsnpdcl.in. Telangana TSNPDCL is going to upload the Sub-Engineer answer key PDF for all sets A, B, C, D. Aspirants appeared for the test can download TSNPDCL Sub-Engineer answer key PDF and evaluate the score by comparing the correct answers. By evaluating the score, the competitors will get an estimate about the rank, score, and future withstand in the competition. Northern Power Distribution Company Limited, Telangana State is the state level organization working for Telangana power supply and other related works. The organization offers various jobs for the interested aspirants. This year the Telangana NPDCL has released the official notification for 497 Sub-Engineer / SE (Electrical) posts. The TSNPDCL has received a great number of applications from the interested and eligible aspirants. To shortlist the suitable candidates out of them the TSNPDCL has successfully organized the examination on 8th July 2018. A huge number of hopefuls have competed for the TSNPDCL Sub-engineer examination this year. All the hopefuls appeared for the TSNPDCL SE examination can cross-check their answers with the TSNPDCL Sub-Engineer answer key 2018. More details about the TSNPDCL SE answer sheet/question paper solutions are given in this article. Aspirants competed for TSNPDCL Sub-engineer examination can check the answer key within 3-4 days after the examination. The answer key will be accessible on the official website, tsnpdcl.in or from tsnpdcl.cgg.gov.in. Candidates can download the answer sheet/question paper solutions for all sets and compare the score with the corresponding set to estimate the score. By calculating the probable score candidates can estimate about their future contending in the selection process. Check the steps to download TSNPDCL Sub-Engineer Answer Key PDF. tsnpdcl.cgg.gov.in is the official portal of TSNPDCL. Have a look at the page. 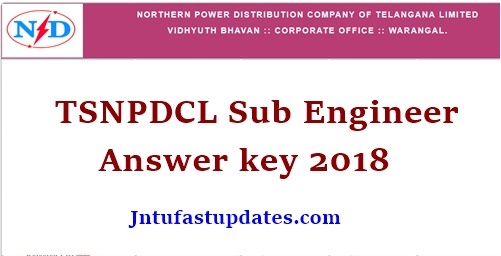 TSNPDCL Sub-Engineer Answer key 2018 Link appears on the homepage. Click on the link. Plz anyone create a whatsapp group so we each and everyone can communicate easily. All npdcl sub engineer exam written students keep a HI message to this number 9704238530. So we can chat in group. How come you got the marks !! !